Dycem ProtectaMat is a high performance contamination control zone designed to attract airborne particles to its surface and decontaminate soles of personnel's shoes and booties. This contamination is held on the surface until cleaning takes place. Use Dycem wherever contamination is a concern: entrances and exits to critical areas, changing rooms, transfer hatches, corridors and airlocks. Dycem's comprehensive range of High Performance Contamination Control Zones reduce particulate counts in all your critical areas. All exits to prevent contamination leaving the critical area. In corridors to prevent cross contamination. Inside the critical area adjacent to critical products and processes. 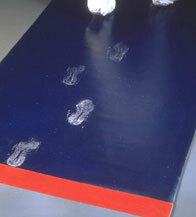 Spillages of any chemicals will not harm the Dycem material if removed immediately.